‘Bizarre’, ‘quirky’ and ‘unique’ are the most common words heard in Upper Gardner Street when sellers describe what they have on display in the flea market in Brighton. Passers-by can purchase wares from French 1895 vintage fabric to Victorian antiques. A 110-year-old clock, an 80-year-old wooden golf club and a shooting stick are some of the items on sale at John Magee’s stall. John is one of the longest-standing sellers at this market, coming every weekend since he was a schoolboy. “It used to be much more crowded decades ago. Even during the Second World War, we still managed to sell stuff but when the war ended it got much better as people needed to buy many things”, John remembers. He is now 90 years old and still comes every Saturday to accompany his son who has taken over the business. This flea market is located in the heart of the North Laine of Brighton; an area that “used to be narrow strips of farmland that was worth nothing. But today it has turned into a vibrant area with independent shops that you cannot find in another town”, explains the chair of the North Laine Traders Association, David Sewell. 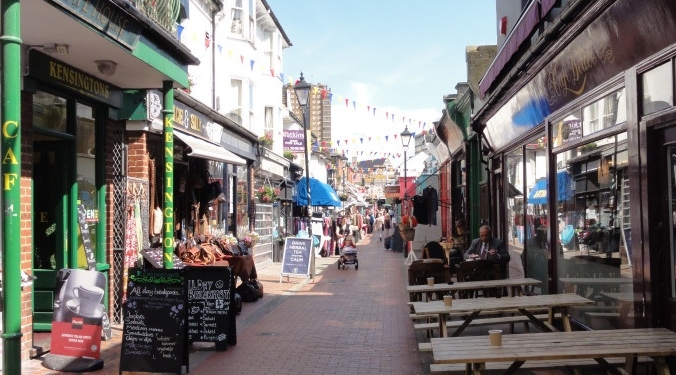 In the mile between Brighton Station and the Royal Pavilion Palace, there are more than 200 shops and 30 cafes; most of them locally run by their owners. One of them is ‘Vegetarian Shoes’; a local shop that produces and sells the usual stuff as snow boots, trainers and sandals, but without using any animal material. A few metres down the street, there is another shop called ‘Cyber Candy’ that imports sweets from around the world to be sold in the UK. Among the sweets they sell there are South Korean cereal boxes and space freeze-dried strawberries, but its star product is the cheese and bacon crickets from California.